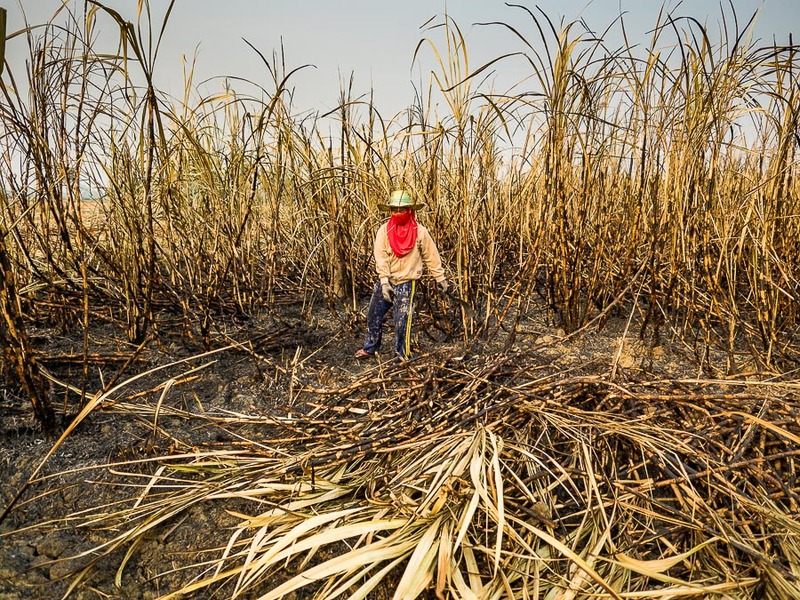 A sugar worker in Kanchanaburi province, west of Bangkok, cuts sugar cane. Thailand is one of the world's leading sugar exporters and sugar is one of the world's most traded commodities. It goes into almost everything we eat (which has creates a whole new set of health issues) and, increasingly, it's used to fuel our cars and trucks. 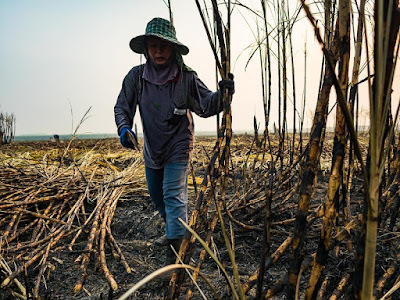 Thailand's sugar yield per acre is expected to go down a little this year because the 2015 rainy season was well below normal and Thailand is in the midst of what could be a crippling drought. The total harvest is expected to increase however because farmers who couldn't plant rice because of the drought instead planted sugar, which was still impacted by drought but not as significantly. A worker in the cane fields. The fields are burned out at night with low slow flames that consume some of the chaff and weeds and chase out the snakes. Harvesting sugar is backbreaking work. 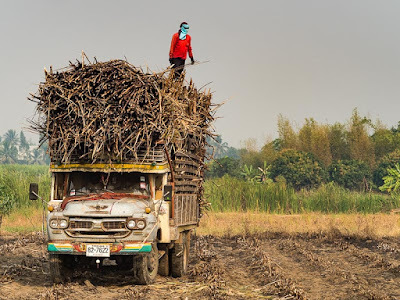 Workers walk through the fields with long knives chopping the plants at ground level then stacking the stalks in rows so tractors with claws can pick up the stalks and put them in trucks. At ground level, this is how sugar has been harvested for centuries. 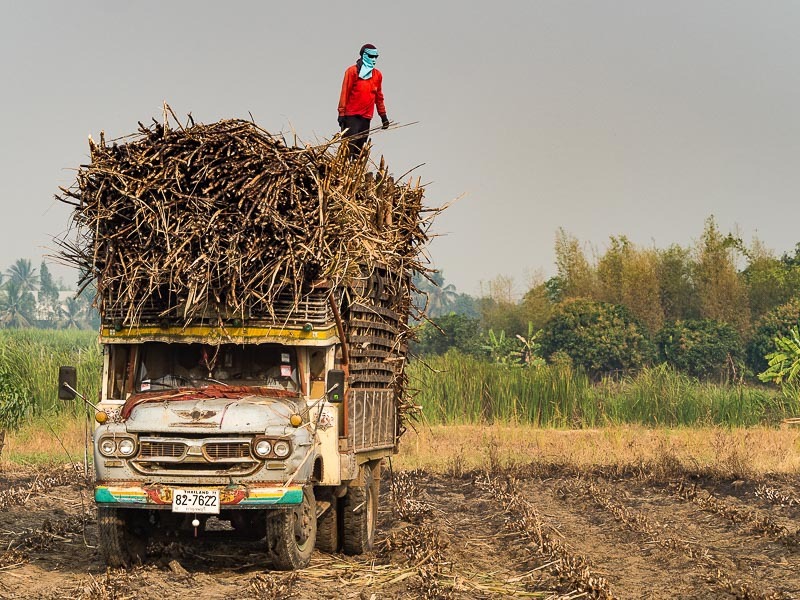 A worker atop a truck that hauls sugarcane to a mill. Trucks like this one jam the rural roads of Kanchanaburi province during the sugarcane season. The trucks are more unstable and unsafe than they look. Workers start just after dawn and work through the day until late afternoon. 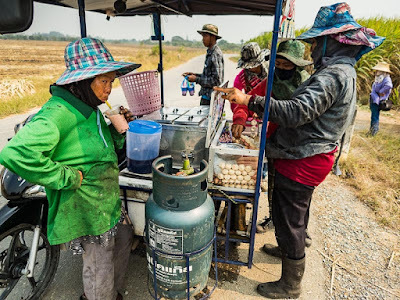 Most of the workers are migrants from Isan (northeastern Thailand) and, to a lesser degree, Myanmar and Cambodia. The workers I photographed, all from Isan, took my presence in stride. In fact they were welcoming. They shared their breakfast with me (sticky rice and grilled fish) and asked me what I was doing. I used the translate app in my phone to explain that I was a journalist working on a story about climate change and the Thai drought. When I started photographing, some of the workers joked with my subjects while others asked me to photograph them. Some turned it into a contest to see who could cut the most cane while I was with them. A few gave me their knives and let me try my hand at cutting sugar cane. One swing of the knife was enough to convince me that I couldn't cut cane for a living. A woman and her son finish their breakfast. The boy was not working. There is no day care for Thai farm workers and husbands work alongside their wives, so day care is letting the kids play in the fields. The El Niño caused drought is being felt throughout Southeast Asia. 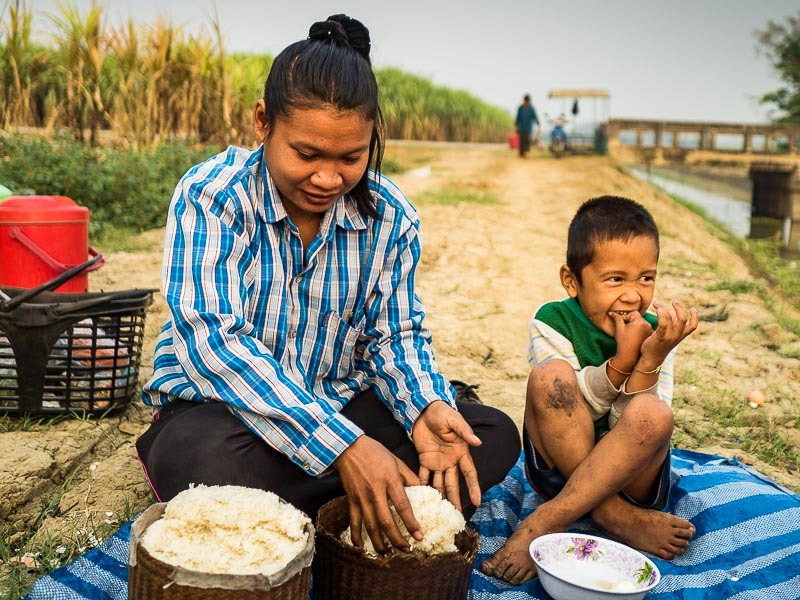 In Thailand, it's contributing to lower yields on important crops like rice and sugar. Farmers, and government leaders, are hoping that rains come in abundance this year after the El Niño fades. Workers buy lunch and snacks from a vendor who motors the roads that run between the fields. 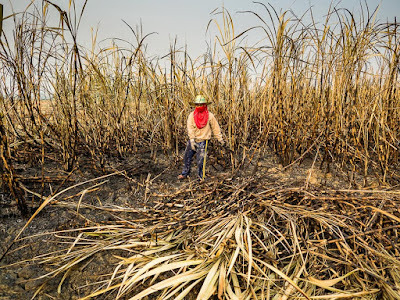 There are more photos from the Kanchanaburi sugar fields in my archive or available from ZUMA Press.